Although I was unable to attend the Chelsea Flower Show this year, I was pleased to see some of our dried roses in attendance! We were very pleased to be contacted by Ernest George who was needing a decorative top dressing for two large planters for the GeoWear GardenGirl exhibit. We were able to supply some mixed burgundy rose buds and petals which were spread about an inch deep in the planters, and used to decorate the accessories. These dried flowers have a delicate sweet scent, which must have added to the cottage garden effect in the warm sunshine. Closeup of our dried rose buds and petals being used as a decorative mulch at Chelsea. 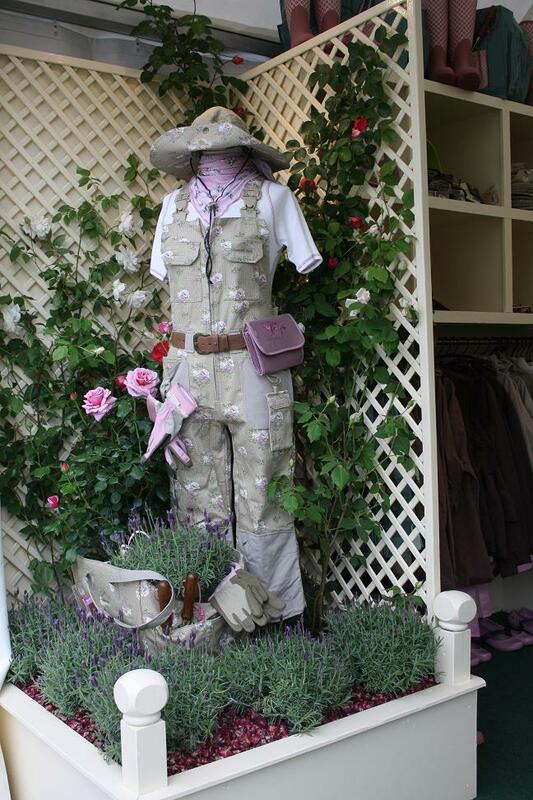 The GardenGirl stand at the Chelsea Flower Show 2013. A classic combination of lavender and roses! Dried rosebuds and petals being used as a decorative ground for garden accessories. The stand got a certificate of commendation for from the RHS for the high quality presentation, and in particular the judges mentioned the use of the rosebuds for mulch! If you are hungry for more about the flower show, check out the Chelsea website if you haven’t already.